We take a punt on Silk Road Chinese Halal Restaurant on Thomas Street Chinatown, it's a winner. Sydney's Chinatown is a fun place to be on a Friday night, the markets on Dixon Street are packed and the queue at Mamak stretches all the way to Kuala Lumpur. Once again Miss Chicken and I have two beers too many at the Covent Garden Hotel, Sydney's finest people watching pub, and our restaurant of choice is closed by the time we arrive. We wander around and find Silk Road Chinese Halal Restaurant is still open. Joy. Cucumber salad. Around $7, lightly spiced and deliciously different. We are starting to think that a cucumber salad is essential with any Northern style Chinese feed, it perfectly cuts lard and stodge. ...with diy wrap-up in pancakes. It's delicious but why do they never give you enough pancakes in these joints? There's six pancakes but enough filling for twelve. It's a tough life eh? Fried Kidney Beans (Spicy) $8.50. This dish was outstanding. Superbly cooked with fresh smokey wok flavours, roasted chili and big hunks of garlic to keep the vampires away. It was quite salty but my god it works. Chinese Egg Soup $6. Miss Chicken ordered this out of curiosity and it blew our fragile little minds, this is a new favourite. It was like a plain, savoury egg custard in a light sauce with flavours of dark soy. It may sound unusual but the taste and texture was sublime. We imagine this is somebody's favourite comfort food. We sidestep the enforced merriment of new year's eve with a walk into Chinatown and a feed at the wonderful Silk Road Halal Chinese Restaurant. Stewed Beef with Nang Bread - $22. Slow cooked meat (we thought it was mutton but the menu says beef) on top of round flat, thick-ish bread. The sauce has a Malaysian curry tang to it and is delicious soaked into the thick bread. The meat falls off the bone and must have been cooked for hours. The dish probably originates from a way to use up old bread. No rice required with this stodge\protein fest on your table. Very happy. Cucumber, tomato and capsicum salad - around $7, counters the stodge of the stewed beef with nang bread. We order this or just plain cucumber every visit. Fried kidney beans $8.50 - another favourite, perfectly cooked, smokey, with a mild chili hit, quite a salty dish by design. The large hunks of garlic are perfect vampire repellent. We drop in for a quick feed on a quiet Tuesday night. We order Fragrant Lamb Chop with Nang ($16.50) because it has a funny name. Little sections of lamb rib coated in cumin with capsicum and fried bread. The fried bread pieces are crisp and crunchy and could be mistaken for potato wedges. Highly recommended. The lamb must be slow cooked because it falls off the bone. Fried noodles in homely sauce ($10) with egg (or chicken, beef, lamb, veggie or leek) is chosen also for it's slightly wacky name. The 'homely' sauces tastes of vinegar and and garlic, it's light and fairly subtle, letting the lovely, chewy handmade noodles speak for themselves. Highly recommended. The noodles and the lamb dish above are an excellent two-dish combo. 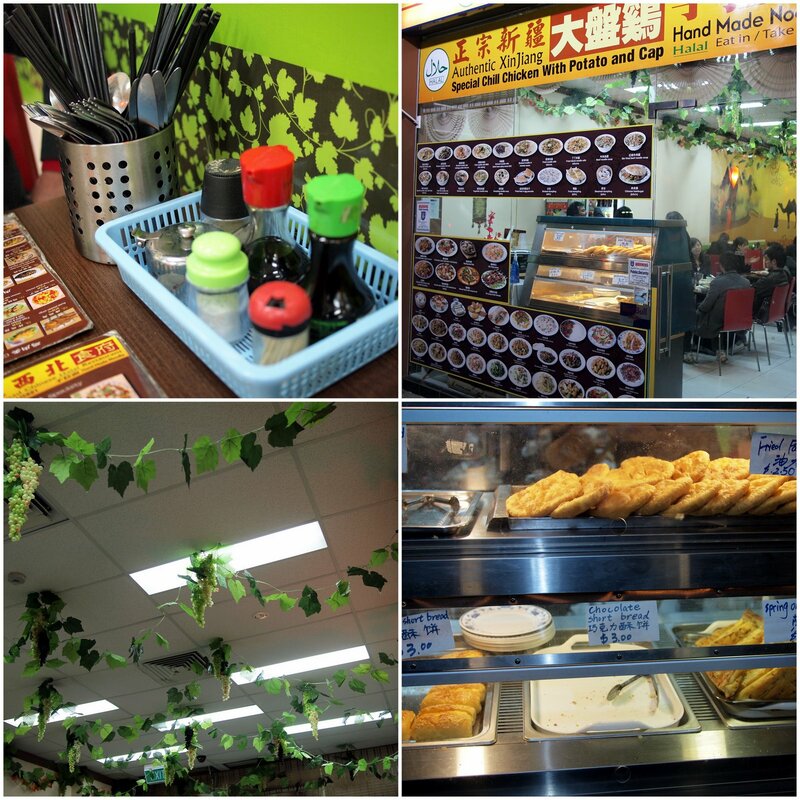 Silk Road Chinese Halal Restaurant is at 2/203 Thomas Street Chinatown, open till late. It's a great late option if the food courts have closed. See our other visit and full menu here. This is probably my favourite Chinese restaurant in town at the moment, everything we have eaten here has been top notch, and there's a lots more dishes we have never seen and are busting to try. Double yum. Silk Road Chinese Halal Restaurant Menu - click to enlarge. Silk Road Chinese Halal Restaurant is at 2/203 Thomas Street Chinatown, open till late.